Hal Snarr: Will the cocktails the policy mixologists keep serving result in the nastiest economic hangover ever? When the economy begins to sink into recession, politicians, economists, policy wonks, and bureaucrats at the Federal Reserve (the Fed) start serving up cocktails of fiscal and monetary stimulus. Although history has shown that the cocktails that these mixologists concoct ultimately gives us a nasty economic hangover, it seems that they have not learned this lesson. The graph below shows how inflationary monetary policy affects the Case-Shiller Home Price Index. In this diagram, quarterly home prices are plotted versus the M2 money stock from just over two years earlier. Since both variables are in log-scale, the red line in this graph implies that after the Fed raises the growth rate of M2 by 1%, the home prices rise by around 0.367%, nine quarters later. 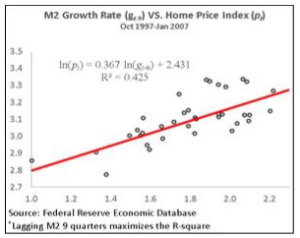 Since the average quarter-to-quarter change in the M2 growth rate is about 16% (this was the case between 1995 and 2004), the line it the graph implies that raising M2’s growth rate by 16% per quarter causes the growth in home prices to increase by 6% per quarter. The compounding effect of a 16%-quarter-to-quarter rise in M2 has a substantial effect on home prices. For example, suppose the M2 growth rate is 2% (M2 growth rate was 1.7% in the third quarter of 1995) at a time when the Fed decides to set interest rates low for an extended period of time. After 12 consecutive quarters of compounding, the quarter-to-quarter M2 growth rate would accelerate up to 10% (the M2 growth rate was 10.2% in the second quarter of 1998). Further, suppose that the quarter-to-quarter home price growth rate is 12% nine quarters prior to the Fed commencing its inflation (the average growth rate in the home price index was 12% from 1997 to 2007). With home prices accelerating at 6% per quarter, the quarterly growth rate in home prices would reach 119% after 12 consecutive quarters of M2 growing at 16% per quarter. The acceleration in an asset’s price is referred to as an asset bubble. These are popped after the Fed pokes bubbles with restrictive monetary policy. Poking asset bubbles usually pushes the economy into a recession. This seems obvious in the graph below. It shows that prior to every recession since the early 1980s, a rapid rise in the federal funds rate has resulted in a recession a few months later. The graphs below illustrate how restrictive monetary policy slows economic growth. In these diagrams, quarterly economic growth rates are plotted versus the quarterly federal funds rate from the previous year. Since both variables are in log-scale, the red lines in these graphs imply that after the Fed raises the federal funds rate by 1%, the economic growth rate declines by 0.4% (0.37% for the earlier period and 0.46% for the latter period). Since the Fed’s average quarter-to-quarter adjustment of the federal funds is 23% (this was the case between 2009 and 2017), the two charts imply economic growth declines by 10% per quarter after the federal funds rate is raised by 23% from the previous quarter. The compounding effect of a 23%-quarter-to-quarter increase in the federal funds rate is substantial. For example, suppose the Fed wants to normalize rates after it had set its target at 1% for an extended period to push economic growth back up to 3%. Further, suppose that 4.25% is considered “normal” for the federal funds rate. To raise the fed funds rate from 1% to 4.25%, the Fed has to boost its target by 23% a quarter for eight consecutive quarters. Doing this dampens economic growth by around 10% per quarter. After the dust settles and negative compounding kicks in over eight consecutive quarters, the economic growth slips to 1.43%, two years after it had recovered to 3%. The chart below plots the average annual federal funds rate over time. It suggests that the monetary policy mixologists at the Fed have failed to learn the lesson that its policies cause the business cycle. The first part of this lesson, call it Lesson 1, is: Economic expansions, the white areas in the graph, begin after the Fed pushes the price of credit too low for too long. The second lesson, Lesson 2, is: Economic recessions, the shaded vertical bars in the graph, begin after the Fed pushes the price of credit well above the natural rate of interest. Is it comforting that the tail end of the above graph, from 2009 and on, appears to show that the Fed has learned Lesson 2? The graph shows that the Fed has slowly pushed the federal funds rate from near zero to around 1 percent in the nine years following the 2008 financial crisis. Keeping the price of credit near zero for such a long time seems to show that the Fed has finally learned that normalizing interest rates from a very low rate triggers recession. On the other hand, the right tail of this graph also suggests that the Fed has not learned Lesson 1. The last time it kept interest rates at around 1% for a few years resulted in the longest recession since the Fed was given the keys to the economy. Since 2008, the Fed has kept interest rates at an even lower level for nine years and counting. If Austrian Business Cycle Theory is correct, then the historic monetary stimulus party of the last nine years may trigger the most painful economic hangover ever. The major indexes continue remain within easy striking distance of all-time highs. There is almost palpable disbelief among the financial cognoscenti that the indexes have not had a correction. Once again I have been reminded about the perils of ignoring a trend. The trend is bullish. A characteristic of a bull market is the markets celebrate good news while ignoring bad news. Bad news sells. As a result, purveyors of news and opinion focus on the bad news as a means to market their product. The bad news last week was impressive. Natural disasters (Hurricanes Harvey, Irma, and Jose), gas shortages, weakness in the US dollar, and an H-Bomb test by North Korea dominated the news. The Republican Party received the worst news when Nancy Pelosi and Donald Trump cut a deal. The deal removed a potential debt ceiling crisis from the equation. The bad news was not totally ignored. This litany of bad news had only a minor effect on the market. Negative news was ignored by the equity markets, but it was not ignored by the VIX and other volatility products. The CBOE Short-term Volatility Index (VXST) showed the greatest reaction to uncertainty by closing at 11.29. up 2.32 or 25.86%. The front month VIX future (VXU7) contango settled at 7.91% vs. Thursday’s contango of 9.75%. Narrowing of the contango percentage shows a greater relative concern for the front month versus the second month. The second week of September is light on economic reports. The only numbers of note will be on inflation and industrial production. The impact of the hurricanes may push Fed unwinding further out into the future.the future. The week winds up with consumer sentiment winds up Friday and will tally the psychological effects of both Harvey as well as Hurricane Irma. The wild cards remain North Korea and pull together a tax reform bill. There are very few earnings announcements this week. The highlights include: United Natural Foods, Cracker Barrel, and Oracle. Confirm the date and time of any company’s earnings announcement before trading any earnings announcement strategy. The most accurate source of this information is the company’s investor relations website. International: Japan Tertiary Index – 1:30AM. Earnings: None meeting scan criteria. Economic: NFIB Small Business Optimism Index – 6:00, Redbook – 8:55, JOLTS – 10:00.
International: Great Britain CPI – 4:00 AM. International Economic: Germany CPI – 3:15 AM, Great Britain Labour Market Report – 4:30 AM, Eurozone Industrial Production – 5:00 AM. Economic: Weekly Jobless Claims – 8:30, Consumer Price Index – – 8:30, Bloomberg Consumer Comfort Index – 9:45, Quarterly Services Survey – 10:00, EIA Natural Gas Report – 10:30, Money Supply – 4:30.
International: Great Britain Retail Sales – 4:30 AM. Other: Bank of England Announcement & Minutes – 7:00 AM. Economic: Retail Sales – 8:30, Empire State Manufacturing Survey – 8:30, Industrial Production – 9:15, Business Inventories – 10:00, Consumer Sentiment – 10:00, Baker Hughes Rig Count – 1:00.
International: Eurozone Merchandise Trade – 5:00 AM. Economic: Housing Market Index – 10:00.
International: Eurozone HICP – 5:00 AM. The end of the month was on Thursday last week. Pundits across financial media were focused on telling investors about the impact of the first losing month in four months. Time and energy were spent on what a losing month for the indexes would portend for the rest of the year. It turns out we were able to witness a monumental waste of time, energy and breath. The only major index with negative monthly performance was the small cap laden Russell 2000. The end-of-month and end-of-week market rallies were the result of a consensus that Hurricane Harvey as an impetus to force come to an agreement on the debt ceiling increase. This view put concerns about North Korea and a government shut down in the rear-view mirror. However, North Korea’s detonation of an H-Bomb may have removed some of the investor comfort zone. I am still in a summer state of mind. There was nothing particularly noteworthy about the behavior of the VIX and related products. The S&P 500 went up while the VIX went down. U.S. markets are closed in observance of Labor Day. 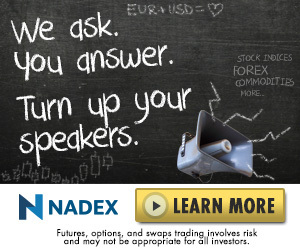 The shortened trading week is quiet on economic reports. Factory orders, mortgage applications, and wholesale trade highlight the balance of the week. In Europe, the European Central Bank is expected to leave their policy unchanged. Merchandise trade and industrial production dominate the economic reports to be released. The wild card remains North Korea. North Korea carried out its most powerful nuclear test this weekend. Off-hours trading on Sunday and Monday showed a muted response. S&P 500 futures were down 6.25 or 0.35%. September VIX futures were up 6.13% or 0.775. This week earnings announcements slow down to a trickle this week. The highlights include: Dave&Buster’s, Hewlett Packard, Casey’s General Stores, Fred’s, G-III Apparel, Korn Ferry, Barnes&Noble, Brady, John Wiley&Sons, VeriFone, and Kroger. Confirm the date and time of any company’s earnings announcement before trading any earnings announcement strategy. The most accurate source of this information is the company’s investor relations website. U.S. Holiday: Labor Day – Markets Closed. International: Eurozone PPI – 5:00AM. Economic: Factory Orders – 10:00, Gallup US ECI – 2:00.
International: Germany PMI Composite – 3:55 AM, Eurozone PMI Composite – 4:00 AM, Eurozone GDP – 5:00 AM, Eurozone Retail Sales – 5:00 AM. Other: Minneapolis Federal Reserve Bank President Neel Kashkari to speak at a moderated Q&A at the 1st Tuesday Speaker Series at Carlson School of Management in Minneapolis, with audience Q&A – 2:00PM, Dallas Federal Reserve Bank President Robert Kaplan to participate in a moderated Q&A session in Dallas, with audience and media Q&A – 7:00PM. Economic: MBA Mortgage Applications – 7:00, International Trade – 8:30, Redbook – 8:66, PMI Services Index – 9:45, ISM Non-Manufacturing Index – 10:00, Beige Book – 2:00.
International Economic: Germany Manufacturers’ Orders – 2:00 AM. Other: Federal Reserve Governor Jerome Powell will deliver a speech entitled “The Role of Boards at Large Financial Firms,” as the breakfast presentation during the Large-Bank Directors Conference hosted by the Federal Reserve Bank of Chicago, with audience and media Q&A, in Chicago – 9:15AM. Economic: Weekly Jobless Claims – 8:30, Productivity and Costs – 8:30, Bloomberg Consumer Comfort Index – 9:45, Quarterly Services Survey – 10:00, EIA Natural Gas Report – 10:30, EIA Petroleum Status Report – 11:00 Money Supply – 4:30.
International: Germany Industrial Production – 2:00 AM, Japan GDP – 7:50 PM, China Merchandise Trade Balance – 10:00PM. Other: European Central Bank Announcement – 7:45 – AM. President Federal Reserve Bank of New York William Dudley will speak about the U.S. economic outlook and implications for monetary policy at a Money Marketeers of New York University event, with audience and media Q&A, in New York – 7:00 PM, Atlanta Federal Reserve Bank President Raphael Bostic to participate in a moderated discussion on his views on the economy at An Evening with Raphael Bostic in Atlanta – 7:00 PM, Kansas City Federal Reserve Bank President Esther George to discuss the U.S. economic outlook at the Omaha Economic Forum in Omaha – 8:15 PM. Economic: Motor Vehicle Sales, Employment Situation – 8:30, PMI Manufacturing Index – 9:45, ISM Manufacturing Index – 110:00, Construction Spending – 10:00, Consumer Sentiment – 10:00 , Baker Hughes Rig Count – 1:00.
International: Germany Merchandise Trade – 2:00 A, France Industrial Production 2:45AM, Great Britain Merchandise Trade – 4:30 AM, China CPI & PPI – 9:30 PM. Other: Philadelphia Federal Reserve Bank President Patrick Harker to speak on Consumer Finance Issues at New Perspectives on Consumer Behavior in Credit and Payments Markets Conference in Philadelphia – 8:45 AM. The truncated, end-of-summer, version of the Prepared Mind. The weekly numbers and economic calendar are here but without commentary. As August comes to a close, reports will be released for the S&P CoreLogic Case-Shiller Home Price Index, the second estimate of U.S. second-quarter GDP, motor vehicle sales, and the employment situation. Important inflation data includes PCE price indexes as part of Thursday’s personal income and outlays report. Other important data includes advance trade in goods on Monday and also home sales on Thursday. Consumer confidence on Tuesday and consumer sentiment on Friday, bring consumer psychology onto focus . Hurricane Harvey, North Korea, and the debt ceiling are in play as wild cards for the upcoming week. This earnings season winds down this the week. The highlights include: G-III Apparel, Scansource, H&R Blockm Movado, Hain Celestial, Best Buy, Shoe Carnival, Dytech, Bob Evans Farms, Chico’s. Brown-Forman, Analog Devices, Vera Bradley, Campbell Soup, Dollar General, Oxford Industries, Genesco and Ciena. Confirm the date and time of any company’s earnings announcement before trading any earnings announcement strategy. The most accurate source of this information is the company’s investor relations website. Economic: International Trade in Goods – 8:30, Dallas Fed Manufacturing Survey 10:30.
International Economic: Japan Unemployment Rate – 7:30 PM. Economic: Redbook – 8:55, S&P Corelogic Case-Shiller Home Price Index – 9:00, Consumer Confidence – 10:00, State Street Investor Confidence Index – 10:00.
International: France GDP – 2:45 AM. Economic: MBA Mortgage Applications – 7:00, ADP Employment Report – 8:15, GDP = 8:30, Corporate Profits – 8:30, EIA Petroleum Status Report – 10:30.
International Economic: Eurozone Economic Sentiment – 5:00 AM, Germany CPI – 8:00 AM, Japan Industrial Production – 7:50 PM. Other: Federal Reserve Governor Jerome Powell will deliver a speech entitled “The Role of Boards at Large Financial Firms,” as the breakfast presentation during the Large-Bank Directors Conference hosted by the Federal Reserve Bank of Chicago, with audience and media Q&A, in Chicago – 9:15 AM. Economic: Chain Store Sales, Challenger Job-Cut Report – 7:30, Weekly Jobless Claims – 8:30, Personal Income and Outlays – 8:30, Chicago PMI – 9:45, Bloomberg Consumer Comfort Index – 9:45, Pending Home Sales Index – 10:00, EIA Natural Gas Report – 10:30, Money Supply – 4:30.
International: Germany Retail Sales – 2:00 AM, France PPI & CPI – 2:45 AM, Germany Unemployment Rate – 3:55 AM, Eurozone Unemployment Rate – 5:00 AM, China PMI Manufacturing Index – 9:45 PM. Economic: Motor Vehicle Sales, Employment Situation – 8:30, PMI Manufacturing Index – 9:45, ISM Manufacturing Index – 110:00, Construction Spending – 10:00, Consumer Sentiment – 10:00, Baker Hughes Rig Count – 1:00.
International: Germany PMI Manufacturing Index – 3:55 AM, Eurozone PMI Manufacturing Index – 4:00 AM. International: Eurozone PPI – 5:00 AM. International: Germany PMI Composite – 3:55AM, Eurozone PMI Composite – 4:00AM, Eurozone GDP – 5:00AM, Eurozone Retail Sales – 5:00AM. Other: Minneapolis Federal Reserve Bank President Neel Kashkari to speak at a moderated Q&A at the 1st Tuesday Speaker Series at Carlson School of Management in Minneapolis, with audience Q&A – 2:00 PM, Dallas Federal Reserve Bank President Robert Kaplan to participate in a moderated Q&A session in Dallas, with audience and media Q&A – 7:00 PM. I am posting a truncated version of the Prepared Mind. The weekly numbers and economic calendar are here, but without commentary. Janet Yellen’s Friday speech at the Jackson Hole Economic Policy Symposium will be the week’s most important event. The sector focus for the week will be Housing. FHFA House Price Index will be announced on Tuesday followed by New Home Sales on Wednesday and Existing Home Sales on Thursday. Durable Goods Orders will be will be announced on Friday prior to Janet Yellen’s speech. This earnings season winds down this the week. The highlights include: Nordson, Toll Brothers, Cree, Medtronic, Salesforc.com, Eaton Vance, PVH, HP, Guess?, Williams Sonoma, Lowe’s, Sanderson Farms, Dollar Tree, Staples, Hormel Foods, JM Smucker, GameStop, GameStop, Ulta Beauty, Toro, and Big Lots, Confirm the date and time of any company’s earnings announcement before trading any earnings announcement strategy. The most accurate source of this information is the company’s investor relations website. Economic: Chicago Fed National Activity Index – 8:30.
International Economic: Japan All Industry Index – 12:30AM. Economic: Redbook – 8:55, FHFA House Price Index – 10:00, Richmond Fed Manufacturing Index – 10:00.
International: Great Britain CBI Industrial Trends Survey – 6:00AM. Economic: MBA Mortgage Applications – 7:00, New Home Sales – 10:00, EIA Petroleum Status Report – 10:30. Economic: Weekly Jobless Claims – 8:30, PMI Composite Flash – 9:45, Bloomberg Consumer Comfort Index – 9:45, Existing Home Sales – 10:00, EIA Natural Gas Report – 10:30, Kansas City Fed Manufacturing Index – 11:00, Money Supply – 4:30.
International Economic: Germany PMI Composite Flash – 3:30AM, Eurozone PMI Composite Flash – 4:00AM, Great Britain GDP – 4:30AM. Other: Jackson Hole Economic Symposium. The Federal Reserve Bank of Kansas City has hosted an annual economic policy symposium. The event is designed as a forum for central bankers, policy experts and academics to come together to focus on a topic that is not necessarily of immediate concern, but instead looks into the future at emerging issues and trends. Economic: Durable Goods Orders – 8:30, Baker Hughes Rig Count – 1:00. Other: Jackson Hole Economic Symposium continues through Saturday. Federal Reserve Chair Janet Yellen to speak at Federal Reserve Bank of Kansas City Economic Symposium on Financial Stability in Jackson Hole.- 10:00AM.